The last couple of days have been relatively quiet here in McMurdo. Saturday the weather was pretty windy and cold, so I stayed inside as much as I could. Sunday I walked out to Hut Point to check for penguins, and hurried the last bit of the way there because I could see a bunch of people all looking out over the water. Unfortunately, this did not mean that there were any penguins or seals. Our balloon has been getting farther and farther south. Apparently Google Maps only has maps and satellite imagery up to 85 degrees south, so we're in uncharted territory. The balloon has made a series of loops and swirls and hasn't gotten particularly far in the last couple of days. Hopefully we'll start moving along on our third time around soon. Otherwise, life hasn't been too exciting. I've been working some on a proposal for an external fellowship, and Sean and Thomas have been working out at LDB packing things up and getting everything ready for recovery. 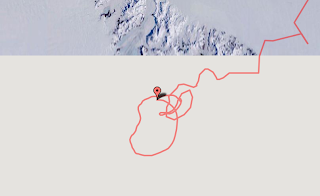 JohnE and I have now been in McMurdo for 11 full weeks, 6 before launch and 5 after.